Yoga, Yogalates, Fitsteps, Swiss Ball, Body Fusion and Zumba classes at the Michelin MAC Sports Centre, Stoke-on- Trent. Aby Kate runs several classes a week at the Michelin, Monday evening Fitsteps 6pm, *New Class* Thursday evening Body Fusion 6pm, Thursday evening Swiss Ball 7pm, Thursday evening Fitsteps 8pm, Friday lunchtime Yogalates 12:30pm, Friday evening Yoga 7pm, Sunday evening Zumba 6pm and Sunday evening Yoga 7pm. Friendly classes for men and woman of all ages and fitness levels. Friday evening at Michelin Sports Centre 7:00-8:00pm Hatha Vinyasa Yoga class – is a flowing style of yoga that harmonizes breath & movement to give strength & agility suitable for all levels. Sunday evening at Michelin Sports Centre 7:00-8:00pm Hatha Intermediate Flow – a strong and energising class incorporating more advanced poses, some Yoga experience helpful. Swiss Ball class at the Michelin every Thursday evening 7pm. Using the inflatable Swiss ball this makes a challenging low impact conditioning workout, focusing on strength, stamina, coordination and balance. Aby combines her knowledge and creates a mix of up-tempo dynamic movements and slow controlled exercises, choreographed to upbeat music. This class is not suitable for someone new or returning to exercise, also not suitable if pregnant. As with all classes Aby will still cater for varying fitness levels, and will suggest alternatives and encourage rest periods if needed. FITSTEPS is an energetic, upbeat dance fitness class mixing graceful steps of Ballroom and the up-tempo steps of Latin dances designed by Natalie Lowe, Ian Waite (from Strictly Come Dancing) and Olympic swimmer Mark Foster. Fitsteps is a fun heart pumping workout where you dance styles from ‘Strictly Come Dancing’ and ‘Dancing with the Stars’ such as the American Smooth, Cha Cha Cha, Paso Doble and Viennese Waltz. No partner needed. This class is great if you love dancing, want a creative outlet and master new skills. 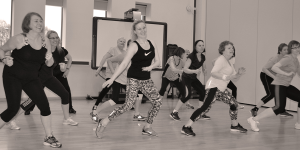 Fitsteps is an enjoyable workout for all ages and fitness levels, this class will keep the brain active and healthy, improve muscle tone & strength, balance & coordination and increase aerobic fitness. Aby continues to deliver amazing classes, dance to great music, workout without even realising it! Aby keeps routines fresh and current, maintaining a balance between dance and fitness. Zumba is perfect for everybody and every body, regardless of age, gender or fitness level. Zumba classes are designed to have fun and bring people together who just love to dance. A mix of low and high intensity moves for an interval-style, calorie burning class. To book a class at the Michelin, Stoke-on-Trent simply contact us.